Published by Jessica Kingsley Publishers. There are forewords at the beginning of the book from Sarah Hendrickx, Dean Beadle and Tony Attwood. 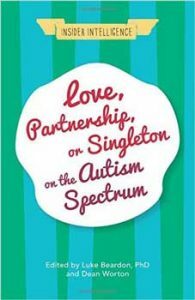 “the wisdom and advice in this insightful book will contribute greatly towards an understanding of relationships from the Autism Spectrum Disorder perspective”. The preface by Luke Beardon is, as always an interesting read and I shall be bringing the book along on the 1 March 2017 for any of you who wish to borrow it. & Director of Axia ASD Ltd.